You'll be £10.39 closer to your next £10.00 credit when you purchase Warriors and Wenches. What's this? The world is full of women we don’t know whose stories have been overlooked or airbrushed from history. Often faced with limited life choices, this book proudly showcases those women who took matters into their own hands and became forces to be reckoned with. These are women you SHOULD know about. Love them or loathe them, they made their mark. From cross dressing soldiers to scheming mistresses and courtesans, Warriors and Wenches offers up an indulgent romp through centuries of history, from widows turned tank drivers bent on bloody vengeance and fierce martial arts fighters, to women who magnificently and outrageously turned their social lot in life to their advantage: the mistresses, courtesans and uniquely French maitresse-en-titres who wielded incredible power and influence in the sumptuous courts of Europe. 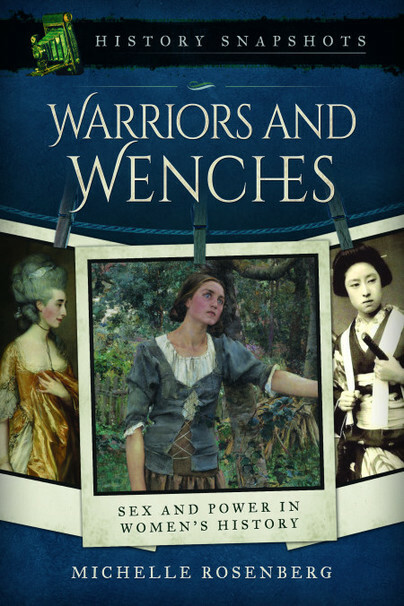 Warriors and Wenches doesn’t seek to decide whether these women were ‘good’ or ‘bad’; we’ll leave it up to you to make up your own minds. But these are just some of the women who, through military skill, incredible courage and loyalty, scandal, poison plots and sexual debaucherie, have crossed over into the realm of legend and myth and become powerful symbols of feminist power. Michelle Rosenberg is a writer and passionate women’s historian with a great fondness for her two daughters, bawdy humour and inappropriate language (in that order). She is on the Advisory Board of the East End Women’s Museum.